The political crisis in the UK has left Brexit in shambles. Foreign manufacturers are exiting. Investment spending is contracting while London house prices are correcting fast. Despite this the UK economy has held up well, thanks to exporters and domestic consumers. 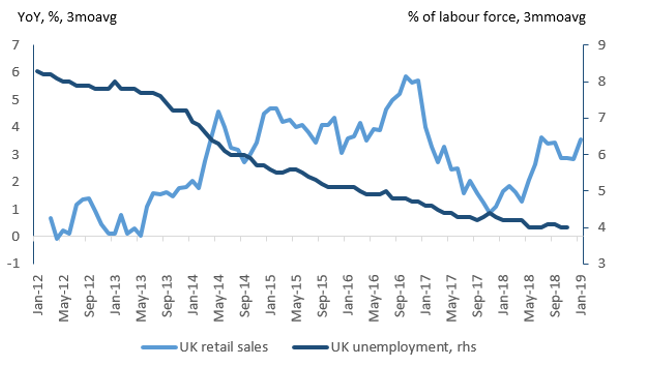 UK economic activity is moderating but not as quickly as in the euro-area where heightened political tensions in Italy and France, a weakening German economy and slower additions to global US dollar GDP have taken their toll. Although Euro-area growth prospects are looking shaky economic activity should revive in 2H19. The same cannot be said about the UK economy. 2. Recession Jitters: The New Fashion? We have been warning about the possibility of weakness in Q2 in these pages. Recently, we are seeing more and more evidence of recession jitters come across our desk. Dark clouds are appearing on the economic horizon. While they do not necessarily mean that a hurricane is ahead, investors have to be prepared for storm fears, and act accordingly. We reiterate our belief that any growth scare is likely to be temporary. There are few financial excesses in the U.S., if unwound, that are likely to plunge the American economy into recession, and most of the risks come from abroad. China is the main source of global concern, and it has already begun another stimulus program, and Beijing is going to pull out all stops to ensure the economy is not tanking ahead of its 70th anniversary of Mao’s revolution in October. Therefore, any growth jitters are likely to be ephemeral, and any resulting market weakness will only be corrective in nature.